It is! Truly wonderful to see it up there. Hey Christina long time no see! Good to see you again Mo! I have been offline for well over a year. Glad to see you are still here and so full of creativity! Still making beautiful, and inspiring art. Just discovered your blog. What a delight! how is your art making going? Very slowly….am just working on a piece with mulberry bark, hoping to somehow merge it with paper and draw on it, several layers to it, there will be a drawing of a heritage seed, (I grew them last year as a seed guardian), a screen print of an old woman…it’s evolving! How do you find time for it all? I can never get it all done! Your work is so skilled and accomplished. Look forward to seeing what you do & re finding time for the making – I wake up at 2am every day to use the quiet hours & have been working at being an artist ever since I learned how to hold a crayon in kindergarten! When do you sleep!? Somewhere I saw a beautiful drawing of a bee on parchment and paper, now where was it? Your blog, fb or website..I would love to see it again. You have grown so much, in so many ways. I thought you would love Bronwyn’s work, she gave me that drawing for my birthday early this year, here’s the link and re sleeping Ariel has taught me the value of catnaps! Great sentiment and one that never changes. Love to you, Mo! (((Julie))) we must catch up the years are flying by, it’s more than 20 years since we were working at the Botanic Gardens! Has it really been that long? Maybe we should meet for lunch at the RBG- I would love to spend some time with you! I have Wednesdays free, so let’s do it soon! Sounds excellent- I usually have a scallywag or two with me Wednesdays as Mandy is now doing Floristry at TAFE but I’ll organise to have one free soon and let you know! this will be a lot of fun, wonder if Troy & Janet are still there? Ah! thank you. Stunning present. Bronwyn’s work is beautiful, thank you for sharing. Your art work is amazing, I especially love your lacey patterns in nature book, at the moment. Also your post/links and creation for the elephants, (we love them). Thoughtful and imaginative. 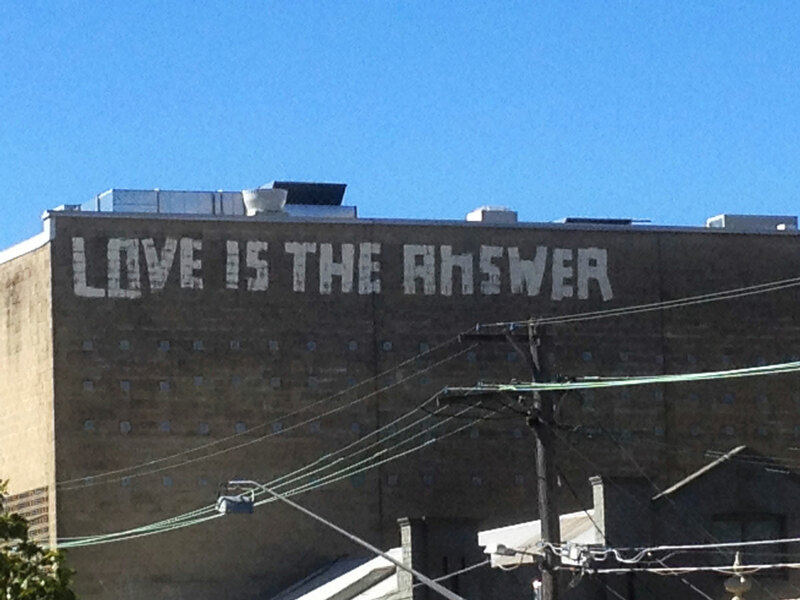 Love IS the answer… So good to see the sign there, Mo! Old Man Crow is writing a song with these words in it, won’t make it into this first volume of illustrated songs but x fingers for the next! Love, love, love….Love is all you need. even still after all these years! i so concur. love is always the answer. you have been busy mo. inspiring .awesome. happy blue moon.